PINS (AUS) (Bay 1996-Stud 2000). 7 wins-1 at 2, VRC Australian Guineas, Gr.1. Leading NZ Sire (worldwide earnings) twice. Sire of 1071 rnrs, 736 wnrs, 80 SW, inc. El Segundo (MVRC WS Cox P., Gr.1), Ambitious Dragon, Legs, Aerovelocity, Katie Lee, Madison County, Porotene Gem, Econsul, A Touch of Ruby, Antonio Lombardo, Mackintosh, Legless Veuve, Shopaholic, Icepin - Regency King (H.K. ), Rolling Pin, Gallopin, Pinmedown, Lauren Tate, etc. DIVINE SHIVA, by No Excuse Needed. 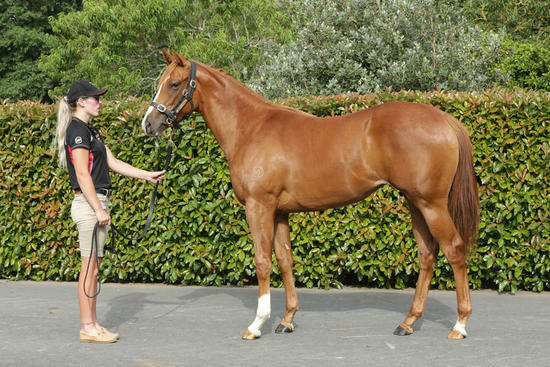 2 wins at 1600m, 3d ARC Ellerslie Event Centre H. Half-sister to ADVENTADOR, WINNING GLORY, ALPINE DELIGHT (dam of ALPINE HEIGHTS), Southern Heights (dam of HONEY RIDER). This is her first foal. ADVENTADOR (Fast 'n' Famous). 7 wins at 1200m, NZ$277,150, WRC Telegraph H., Gr.1, Levin S., L, Hawkes Bay NZ Bloodstock Leasing & Finance Sprint H., Rush Munro's Spring Carnival H., 2d Otaki Maori RC Hunting & Fishing H., Hawkes Bay The Desert Gold Club H., Great Things Grow Here H., Swiss Ace Sprint H., WRC Owners Function H., 3d Hawkes Bay City of Napier Sprint H., L, Manawatu RC Guthrie Bowron H.
WINNING GLORY (One Cool Cat). 8 wins from 1300m to 2300m, A$520,000, Newcastle Gold Cup, Gr.3, ATC St Johns Park Bowling Club H., Summer Super Saver H., Stuart Macdermid's 60th Birthday H., Techstaff H., Bronte H., AJC Triple M H., STC Blackwoods for Alemlube H., 2d ATC Tattersalls Club Cup, L, Hungry Jack's H., Woolworths H., Congratulations Cadel Evans H., 3d ATC Premier's Cup, L, Winter Challenge H., L, Membership on Sale H., Blackwoods MacNaught H., Exponet H., Bridgeview H., 4th Gosford Cup, L.
ALPINE HEIGHTS (Spartacus). 12 wins from 1600m to 2400m, NZ$224,838, WRC Trentham S., Gr.3, Otago RC Dunedin Gold Cup, L, CJC Hornby Working Men's Club Founders Cup, Otago RC Queenstown Cup, Waikouaiti Cup, Otago RC Williams Signs & Graphix H., 2d CJC Spring Classic, L, Otago Cup-twice, Hororata Gold Cup, 3d North Canterbury RC Couplands Bakeries Mile Prelude H., Waikouaiti Cup, WRC Wexford Stables 3YO H., CJC Plough Hotel H.
HONEY RIDER (Pins). 4 wins-1 at 2-at 1200m, 1300m, NZ$86,075, Hawkes Bay Gold Trail S., Gr.3, 2d Cambridge Breeders' S., Gr.3, Wanganui JC Castletown S., L.
Scarlet O'Hara. 6 wins-1 at 2-at 1200m, 1400m, Taranaki RC Energy City Ford H., WRC Tommy's Real Estate H., Southey Family H., Manawatu RC Ashhurst Engineering & Construction H., 2d WRC Fortuna Syndicators H., 3d Otaki Maori RC Ascend Sales Trophies H.
Aurum Heights (Dahar). 3 wins from 1000m to 1800m, AJC Birdcage H., Lakemba H., 3d AJC Chairman's H., Gr.3, STC Canterbury Cup, Gr.3, AJC Staff H. Producer. Waitryst (Bassenthwaite). 5 wins-2 at 2-from 850m to 1600m, 2d ARC Best Bets H., Avondale JC Ra Ora Classic Prelude, Waikato RC Supporters H., 3d Santa Anita Santa Barbara H., Gr.1. Producer. VIEWED (Scenic). Champion Stayer in Australia in 2009. 9 wins from 1300m to 3200m, A$6,006,530, VRC Melbourne Cup, Gr.1, MRC Caulfield Cup, Gr.1, QTC Brisbane Cup, Gr.2, AJC Japan Racing Association P., L, STC Solo Lemon Lime Welter H., Theraces.com.au Welter H., AJC Thirsty Merc Live H., STC Manildra Group H., Guildford Leagues Club H., 2d STC Ranvet S., Gr.1, AJC Dulcify H., L, 3d STC BMW S., Gr.1, VRC LKS Mackinnon S., Gr.1, 4th AJC Chipping Norton S., Gr.1, STC Apollo S., Gr.2. SCRATCHY LASS (U.S. Ranger). 10 wins from 1000m to 1700m, A$364,970, to 2017-18, Oakbank S., L, SAJC Holdfast Insurance H., Myer Fashion Trophy H., Ubet H.